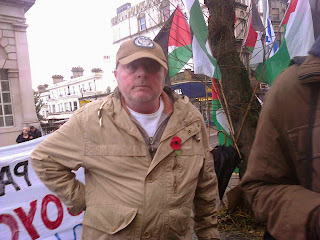 A group of far-Right Zionists, including EDL supporter Simon Cobbs, have attempted to disrupt and stop the picket - but to no good effect. Their main chants when I'm there are 'traitor - presumably a loyal Jew is a racist Jew according to this 'logic'. 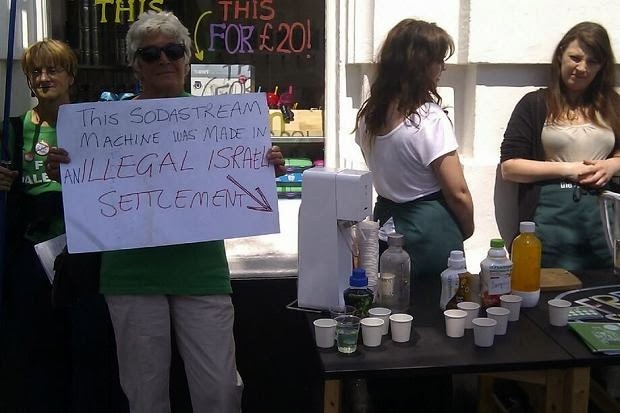 The campaign in Brighton has not only been successful in its own terms but it has sparked a world-wide boycott of Sodastream, a company based on confiscated land on the Mishor Adumim industrial estate between Jerusalem and Maaleh Adumim (an Israeli settlement). Palestinians, of course work there (a favourite Zionist argument) just as they did in South Africa's gold and diamond mines. Not out of choice but necessity. However what expense-paid journalists like Simon Keenan of the Argus appear not to have noticed is that anyone who joins a trade union is a ' trouble maker' and instantly fired. 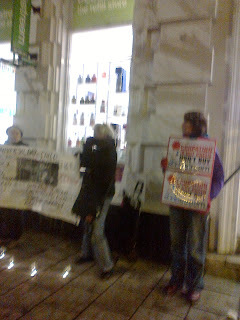 I am pleased to say that during the entire period of our picket, from 5-6 pm, in freezing weather, not a single customer entered the shop and when I went back an hour later the same situation applied. 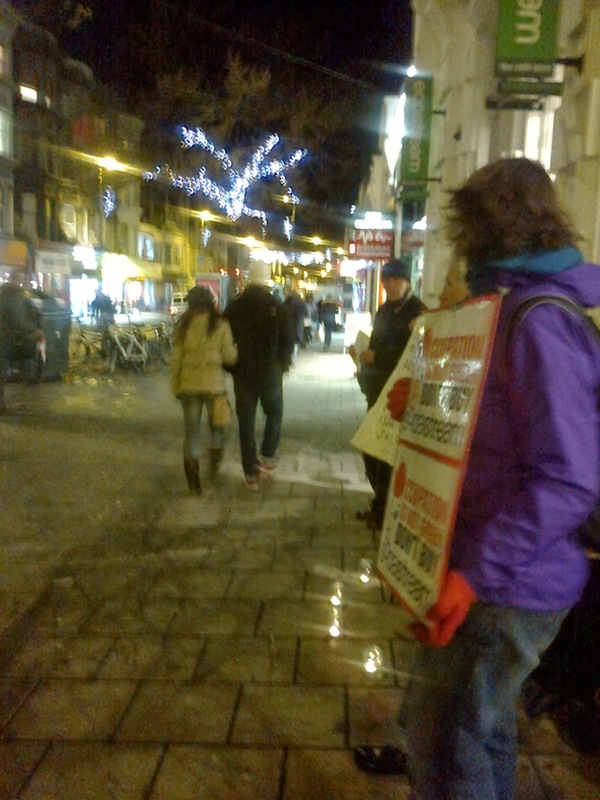 I'd lost count of people who, when taking our leaflets, said they had heard of our campaign. Likewise the number of Jewish people who come up to me and say that the actions of Israel are no different from the traditional anti-Jewish racists. 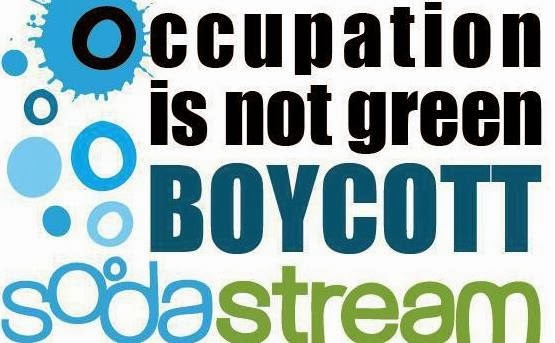 Sodastream, a carbonated beverage manufacturer is based in the Mishor Adumim settlement industrial zone. Mishor Adumim is an industrial are attached to the residential settlement of Ma'ale Adumim, East of Jerusalem in the Israeli occupied West Bank. 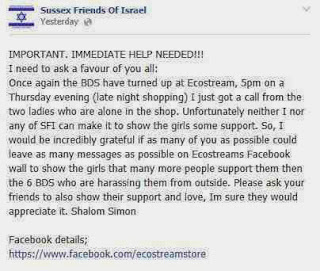 Israeli company Soda Club, which owns the Sodastream brandname, has opened a new store called Ecostream on Western Road in Brighton. Sodastream, a carbonated beverage manufacturer is based in the Mishor Adumim settlement industrial zone. Mishor Adumim is an industrial area attached to the residential settlement of Ma'ale Adumim, East of Jerusalem in the Israeli occupied West Bank. Corporate Watch contacted Steve Bannatyne, who has been employed by Sodastream to open the store in Brighton. Bannatyne said that the store was a place where people could buy refillable bottles for Sodastream syrups and detergents and would be branching out into food products too. 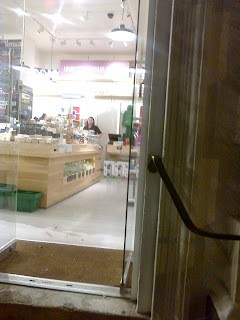 The store stocks a range of Sodastream products. 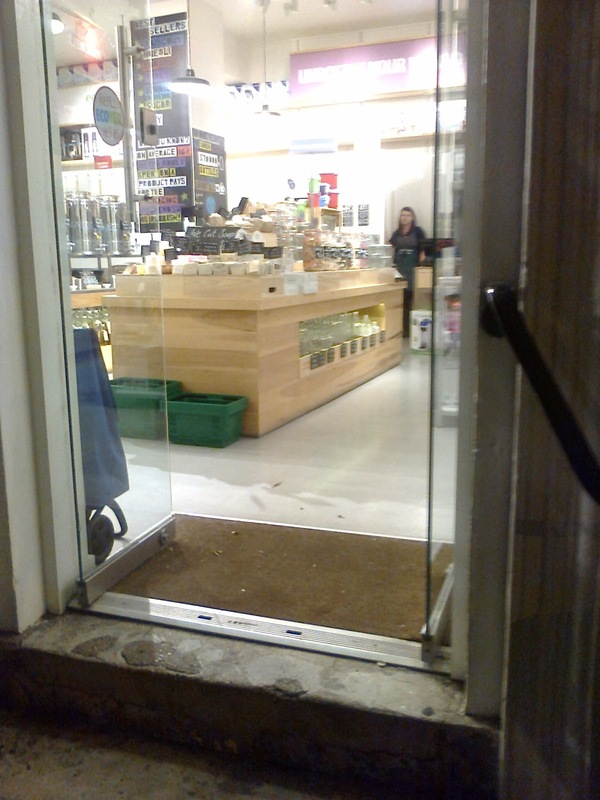 The eco-concept store, which is owned on a lease, is Sodastream's only store in the UK. The company chose Brighton because of the strong green movement in the city. Last month Corporate Watch spoke to a woman who had attended an interview to work at Ecostream but had decided to withdraw her application after she became aware that Sodastream profit from ?from the Israeli occupation and human rights abuses?. Bannatyne said he had passed the concerns on to the company and they had responded but that he felt he was not qualified to comment on behalf of the business? The expansion of Mishor Adumim settlement industrial zone, where the main Sodastream factory is based, is encroaching on the land of the Jahalin bedouin, who are being forcibly relocated to a reservation in Abu Dis, next to the Jerusalem Municipal rubbish dump. 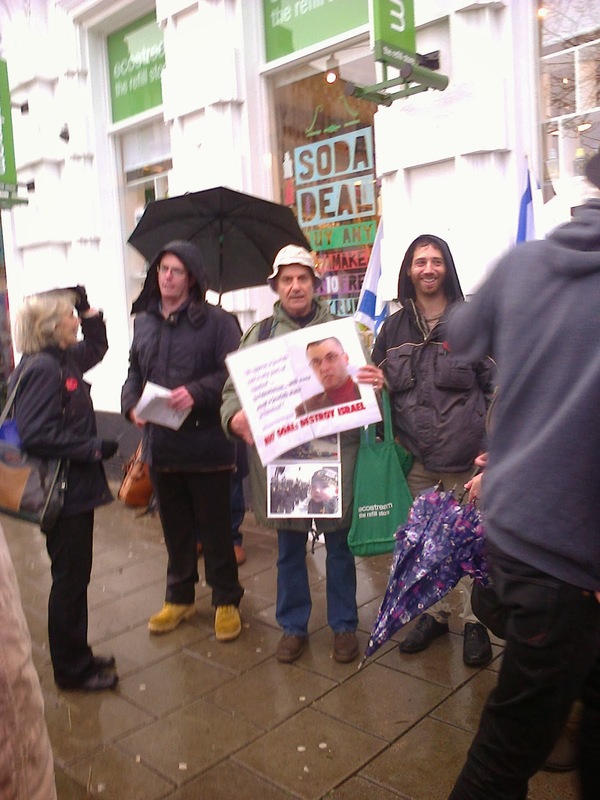 Bannatyne told Corporate Watch that he had been taken on a short visit to Israel by Sodastream where he was taken to two of the company's factories. 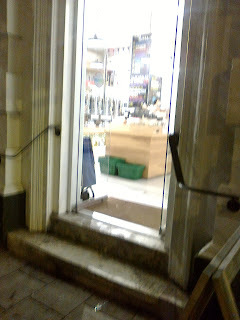 He was taken to the company's Ashkelon factory, inside 1948 Israel, where syrup is manufactured and to the Mishor factory which manufactures 'machinery'. He said he was 'pleasantly surprised' by the conditions at the factories and that he was told that 'the workers were paid more than in the neighbouring villages'. These building restrictions prevent the establishment of any Palestinian businesses, meaning that local Palestinians are forced to work in the settlements. Palestinian agriculture is limited by the settlements monopoly on land and the restrictions placed on the grazing of cattle, often leading to the seizure of cattle by the army see). 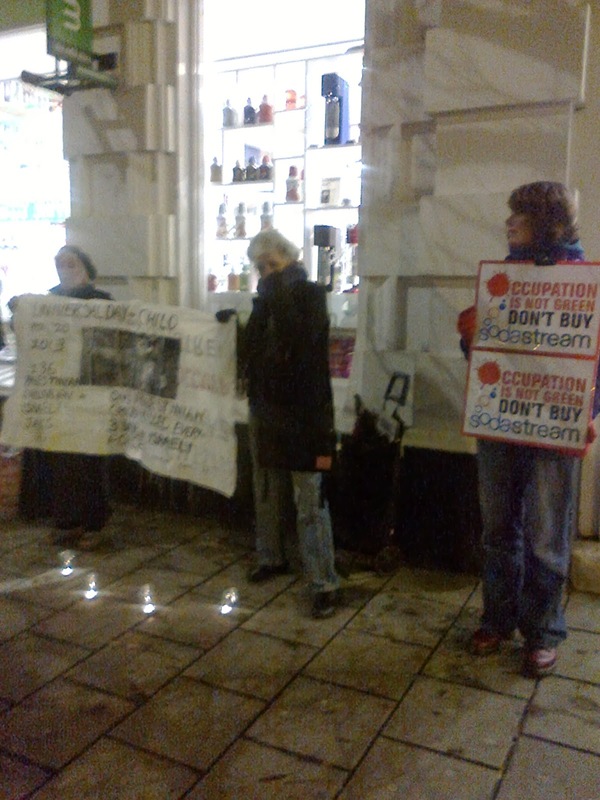 Palestinians working for Sodastream in Mishor Adumim are working in the context of the occupation. 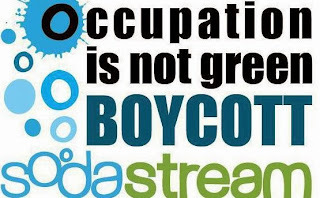 In January 2012 activists from Stop Sodastream Italy made the following statement in response to claims by the company that its workers were well treated: ?the fact remains that, as subjects of an occupation regime, these workers do not enjoy civil rights (including the right of workers to organize) and are under constant threat of having their permits to work in the settlement revoked by the company at any moment.? 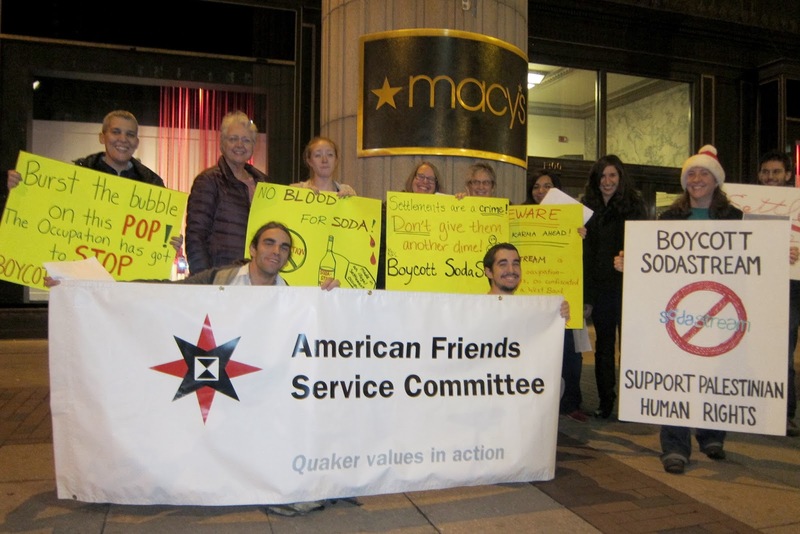 "Palestinian workers often have no choice but to work in the settlements, with high unemployment rates that are a direct result of the Israeli occupation. The 2011 United Nations Conference on Trade and Development report explicitly links the decline in Palestinian agricultural and industrial sectors and the dire humanitarian conditions with Israeli government policies, in particular the confiscation of land and natural resources, restrictions on movement of people and goods, and isolation from international markets. 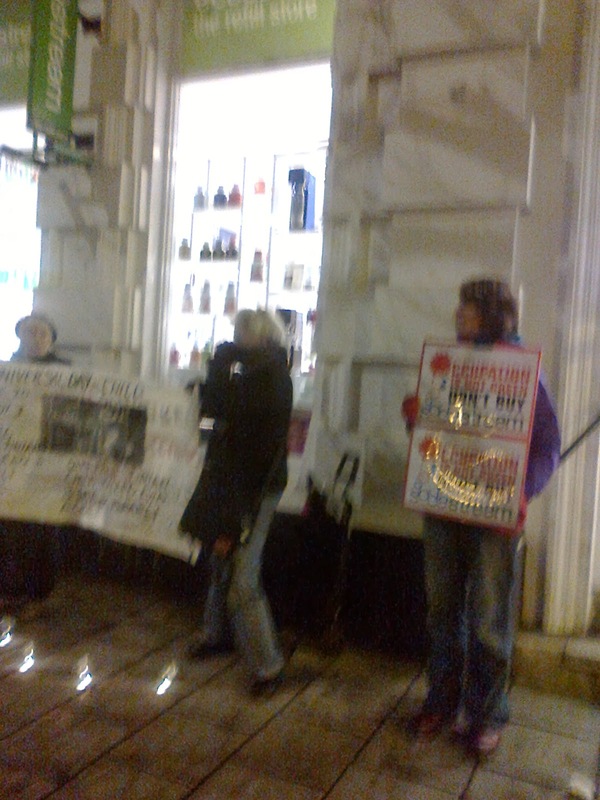 Only a colonial mindset could claim to provide jobs to the very same people whose land and freedom have been stolen." The Palestinian call for boycott, divestment and sanctions urges a boycott of all Israeli companies until Israel complies with international humanitarian law, recognizes the fundamental rights of the Arab-Palestinian citizens of Israel to full equality, the rights of return of refugees and ends the siege of Gaza and the occupation of all lands occupied in 1967. Sodastream products are sold in the UK at Robert Dyas, John Lewis, Argos, Comet, Lakeland and some Sainsbury and Asda stores.